Martin Luther King Jr. Unit Study | My Journeys Through Life . . . Herding Cats In New Mexico! 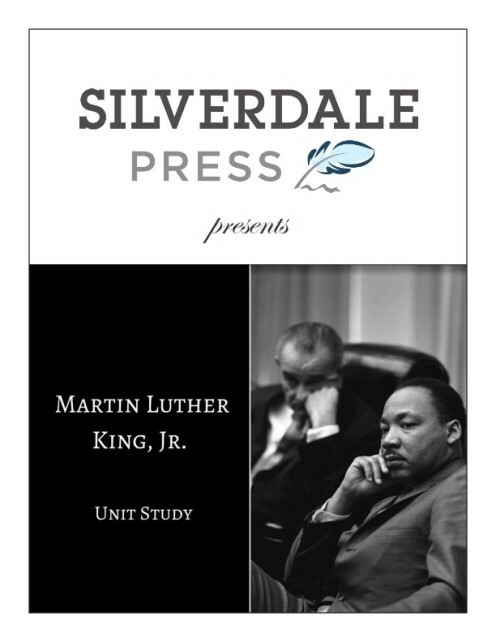 White House Holidays Unit Studies from Silverdale Press LLC are a great way to keep learning happening while taking a break from regular history studies, or, for those who generally use unit studies as the core of their homeschooling, a great way to get history and social studies in for the entire year! Given that two of my boys are biracial, I chose to focus on the Martin Luther King Jr. unit study. We will do this again around the time of the MLK holiday, as well, because I think it’s more important to learn about the person being honored than it is to get a day off from school. It’s always irritated me when schools close for the MLK holiday, rather than spend the day learning about the reason the holiday exists! As I looked over this unit study, I decided that we would take the entire review period with this. The author, Jill Hummer, has written unit studies which are so very rich in information, primary sources and things to do that we could literally make these unit studies our entire history and social studies curriculum for the whole year! As I said above two of my boys (“Mr. loquacious and The Puzzler”) are biracial. They came into our family when they were eight years old. We have even before their adoption when we had just our older boys, had many discussions about the past, when black people could not drink from the same water fountains as white people, or eat in the same restaurants, had to ride in the back of the bus, etc . . . We later after adopting the twins talked about how back then, we would never have been permitted to adopt them. This particular one was brought home to them during an episode of The Waltons that we were watching. I think this has been the best study for us to begin with. One of the things I especially love about this study is that it shows a black family who is able to reach a successful level of living. Martin’s father earned a good enough living as the Pastor of a good, giving church to provide for his family. The children did not have to go out to work (as children), quitting school to help keep the family going. This is because his parents were frugal, and never lived beyond their means. Mrs. King did have to raise her children in the days of segregation and discrimination, considerably worse discrimination than exists now. However, I realized that some things don’t change too quickly. We have had to have the difficult discussions with our boys who are people of color about the extra need for them on how to react if stopped for any reason by the street. And ladies will still pull purses closer when black people, especially boys and men are near, and they will be more likely to be watched in a store. It is sad that we haven’t come further than that. Of course we homeschool, however they were quite shocked to find out that they would not have been permitted to go to the same school as white children even as late as 1957, the year before I was born. Three years previously, the United States Supreme Court handed down Brown v. Board of Education, making it illegal to segregate black children from white children. State Governors refused to comply, and in 1957 Little Rock, Arkansas, Governor Orval Faubus ordered the Arkansas National Guard to surround the city’s Central High School on the night before school was to start. He told the troops to stop nine black students—the first to attend Central High, from stepping into the building. He was convinced to withdraw them by President Eisenhower. When the students tried to go to school, riots erupted outside of the school. Eventually President Eisenhower sent in 1,000 U.S. Army paratroopers from the 101st Airborne Division to Little Rock for a year to make sure Central High was integrated and that the students and city were kept safe. All four of my boys were astounded that this was just one year before I was born! They were further shocked that black people were kept from voting, even for a while after that. There are so many good activities for students to do in each lesson, that we don’t want to miss any! I can see this study taking us some time to get through, because I have special needs kids, but also there are SOOO many rabbit trails we find ourselves going down, and my boys have lots of question I don’t want going unanswered. This is one big positive to doing these studies as a homeschooler, because we don’t HAVE to finish within a specific time period. we can take our time, and learn about every single question they have, even if learning about Martin Luther King Jr. and the holiday set aside to honor him takes months! I am very much looking forward to including all of these into our school year to come! 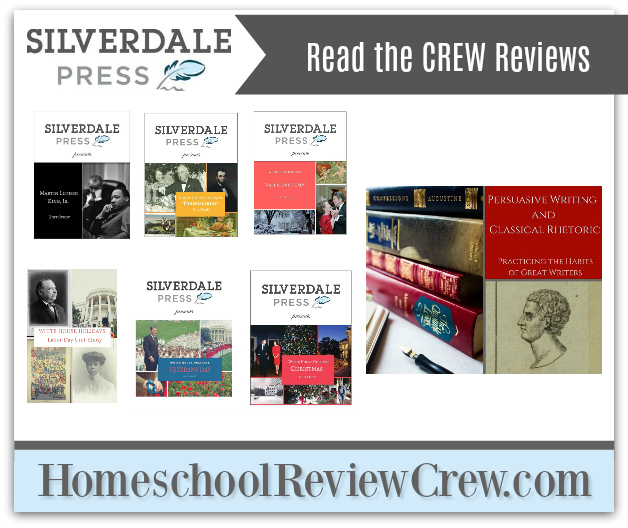 Please click on the banner below to read the fair and honest reviews of 74 other crew members as they write about White House Holidays Unit Studies and Persuasive Writing & Classical Rhetoric: Practicing the Habits of Great Writers from Silverdale Press LLC.